After multiple editions and printings in just two years, the bestselling 'The Maps of Gettysburg' is available for the first time in a full-color, hardcover edition! Thousands of books and articles have been written about Gettysburg, but the operation remains one of the most complex and difficult to understand. 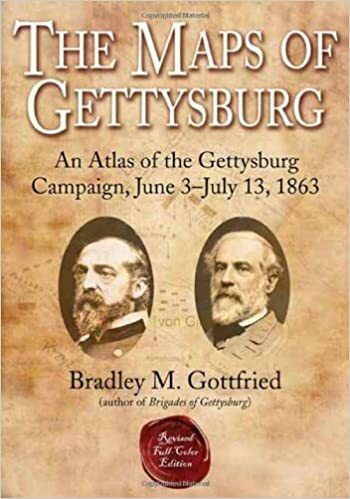 Bradley Gottfried’s groundbreaking 'The Maps of Gettysburg: An Atlas of the Gettysburg Campaign, June 3 – July 13, 1863' is a unique and thorough study of this multifaceted campaign. The 'Maps of Gettysburg' breaks down the entire operation into thirty map sets or “action-sections” enriched with 144 detailed, full-page color maps comprising the entire campaign. These cartographic originals bore down to the regimental and battery level and include the march to and from the battlefield and virtually every significant event in between. At least two―and as many as twenty―maps accompany each map set. Keyed to each piece of cartography is a full facing page of detailed text describing the units, personalities, movements, and combat (including quotes from eyewitnesses) depicted on the accompanying map, all of which makes the Gettysburg story come alive. This presentation makes it easy for readers to quickly locate a map and text on virtually any portion of the campaign, from the march into Pennsylvania during June to the last Confederate withdrawal of troops across the Potomac River on July 13, 1863. Serious students of the battle will appreciate the extensive and authoritative endnotes and complete order of battle. They will also want to bring the book along on their trips to the battlefield. Perfect for the easy chair or for stomping the hallowed ground of Gettysburg, 'The Maps of Gettysburg' is a seminal work that belongs on the bookshelf of every serious and casual student of the battle. About the Author: Bradley M. Gottfried, Ph.D., is the President of the College of Southern Maryland. An avid Civil War historian, Dr. Gottfried is the author of five books, including 'Brigades of Gettysburg: The Union and Confederate Brigades at the Battle of Gettysburg' (2002). He is currently working with co-editor Theodore P. Savas on a Gettysburg Campaign encyclopedia.